Become a Partner of Persian Kitten Empire or Sell your kittens through us. 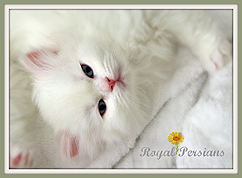 Royal Persians Creating a lifetime of memories, one kitten at a time! Royal Persians is a small in-home cattery. All of our cats are our pets first and therefore are treated as such. We groom, play with and love each one of our adult babies & kittens. We are widely respected and well known for our strikingly beautiful Solid White, Blue Eyed, Doll Faced Persians. All of our Persian cats are CFA registered. We breed only the finest Grand Champion Persian bloodlines and strive to breed pairs that create a perfect blend of Health, Beauty & Personality. All of our kittens come with our exclusive one year health guarantee! We breed the following: Solid Whites, Bi-Colors, Tabby, Shaded Silver and Chinchilla Silver Please visit our website to reserve your dream kitten today! www.royalpersians.com www.kittens-forsale.com Thank you for your interest in our Persian kittens!